The Weather Girls were Izora Armstead and Martha Wash, and were first known as Two Tons O' Fun, but released their first album as The Weather Girls in 1983 entitled Success. 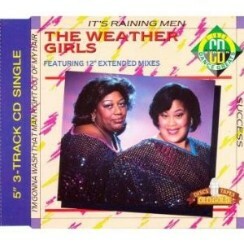 This was a six track album featuring It's Raining Men, although each song lasted between 4 and 6:30 minutes. 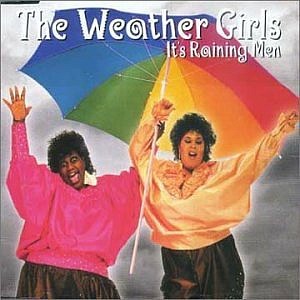 It's Raining Men was the African-American duo's only hit single in the U.S. reaching #46, whilst in the UK the song fared much better reaching #3 in November 1984. However, the girls faired well in the U.S. Dance Charts, reaching #1. They also achieved another four #2 Dance Chart hits between 1980 and 1993. Sadly, original member Izora Armstead died in 2004. Her two daughters have taken over the role as The Weather Girls and released an album entitled Totally Wild in 2005.